But you should see him now.....he runs and jumps with the best of them, so hard to believe with what he's been through!!!! Just goes to show how resilient dogs are!!! And how they forgive and forget!!! So a couple of things for today. First, an update of Mr. Murray!!! He went to his vet this week and basically she gave him a clean bill of health. His pelvic fractures have healed quite nicely as has his shoulder. No more infection!!! He's getting around quite well, but he's still a little wobbly. He will have to be treated for heartworms and we probably won't introduce him to the other dogs for some play for a month or so.....but he's on the mend. Spends the day playing with his toys and resting. It's hard to think that just three months ago he couldn't move!!! Murray wants to say thanks for all the donations and well wishes he has gotten!!! This morning we had an adoption too!!! Eduardo, a young guy who just moved here from San Diego, came to pick out a dog. He told me the first thing he wanted to do when he moved to town was adopt a Husky. He looked at many of our girls, but in the end he was most taken with Solome/Mrs. Smith and decided she would be his new companion. We went and picked up food and a crate , as well as a new collar and lead. I know that Solomon/Mr. Smith was a bit sad, we will just have to find a new girlfriend for him to have playtime with. I'm very happy that she found a wonderful home, I know she will be very happy!!! You and Eduardo have a great time together girl!!!! So this is going to be very picture heavy....not a lot of words. Tomorrow will update Murray....he was at the vet today, we'll see what happened!!! Our beautiful girl, Dakota, manning the booth!! Honey, our honorary Husky with the girls! Wayne looking for treats in the corner...Joella really wants those! Becky,Val and Cyndii with the totally not paying attention dogs, Ciella, Wayne and Joella!!! Ericka...one of our adopted dogs....hope I spelled that right!!! Sherlock, one of our fosters dogs, won the costume contest....we are really loud girls!!! Joella trying on a Kumfy Vest! So , yes , it's April 15th and I'm still doing my taxes. I try every year to get them done early and I'm always sitting here finishing them today.....oh well. 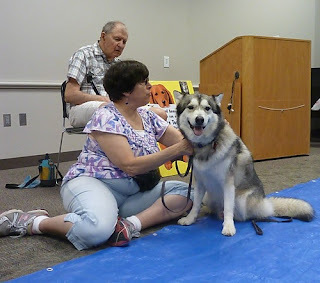 So I'm taking a break right now and thought I'd write a little about Pet Expo. We had a good time, but it's the longest show we do in terms of hours, 9 hours on your feet is not a happy day for me. But I put on my game face and make a great time of it!!! Today I'm only going to touch on the high and low of the day for me. So for the low......I totally missed Loving Max's mom. I left the booth to eat and she came by. So sorry, have always wanted to meet another Houston blogger. We will meet soon!!! OK, high point of the day...getting to see Miss Meeshka again. She was my foster and she found her forever home last year at Pet Expo. Her mom and dad, Tina and Dave came by and I was so happy to see her I almost cried!!! Of course when they gave me a present from Meeshka, I really did cry a bit. Miss M gave me a beautiful photo of herself....I'm looking at it right now, it's sitting on my desk. She is a wonderful girl and I know she has the best home. I didn't think she would remember me , but walked right up and showered me with kisses. I will always love that girl!!!! So you guys know I do dog rescue, I not only work with Husky Haven , but in my free time help other rescues dogs. I've also rescued a cat here and there. But there are so many other animals that need help.....this is my story for today. Look at these beautiful horses, they were skin and bones when they took them in. I was so in awe of how fantastic they looked!!! All these guys too were rescue animals......just showing that all creatures need our help. For me , of course, I can only take the dogs or cats, I don't think my homeowners association would allow a couple of horses in my backyard. But for those of you with a bit of land you can be a savior to any animal. I want to thank Lynne and Dave for all they do for the rescue community , and being good friends!!!! It's Friday again, and another busy week. My petsitting is doing really well....have gotten a ton of jobs. My only complaint this week is the weather, I'm sick and tired of waking up to temperatures in the 30's, that's just wrong at this time of year. I like Houston because of the heat....so come on and get here!!!! Okay...on to dog related things. A couple of weeks ago we had a foster family become an adoptive family. They came to look at some of our older dogs, they have an older one and wanted a companion. They looked a quite a few of our dogs and had it down to Ciella and Snowboy. I really thought Snowboy would be too young for their dog, but in the end, Mom liked him the best and they decided to foster and see if it would work out. Turns out Snowboy fit in very well, he got adopted the next week and his name is now Ice. He was in kennel for quite a few months, so I'm super happy that he gets a forever home!!!! How could anyone resist that sweet face!!! Here he is with his new family...I know he is having a great time and I hope to soon get some pictures with his new buddy. Have a great new life Ice, we will miss you!!!! Wanted to include a picture of my friend Dos...he is one of my pettsiting dogs. He really hates it when I leave, as you can see!! They have a window in the front door and he cries every time I go away. He's such a sweet boy!!! Mr. Dos...wanting to come along for the ride!!! On of the other dogs I take care of is Lilly. She is a cute one-eyed dog. She will actually be at an adoption event this weekend with Twyla's Friends....check them out, they have a lot of great pets ready for adoption. Lilly is a Boxer/Boston mix...she is still a puppy with loads of energy, the one eye doesn't phase her at all!!! 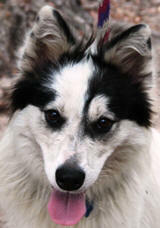 Another good thing for this week was getting a foster for one of our girls , Fiona. As you can tell by the picture, she's more Border Collie than Husky. I was never able to take her to events because she didn't look like a Husky, but now she will be able to go to some adoption shows....I think she will get a home soon!!! Some Iniki and Murray updates , and if I can figure out how to get my video on to my computer, an update of BLD/Trooper too. Wow, it's April already!!! So my April Fools Joke was not posting yesterday!!! So, first thing I want to talk about is Pet Expo. 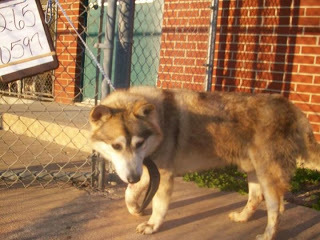 Husky Haven has a booth there at Reliant on April 13th. If any of you reading my blog are in Houston, please come and say Hi!!! We will be by the agility ring, the show is free , but $10.00 for parking. Come on down!!! Have a nice update on one of our fav babies, Petrov. He was adopted about a year ago, and I never saw any pics coming, so just assumed everything was great. He was adopted to a terrific family. Last week we got some pictures of our boy. These are of him at the Freeman Library in Clear Lake. He was part of the petting zoo at the library that day. The group picture is from their local paper, The Citizen. We love you little boy....and know you are having a great life!!!! Updates on our Iniki and Murray. Iniki had her staples removed this last week and seems to be doing well. Murray , conversely , is having problems. He is not using the leg he had surgery on, we don't know if it's still because of the infection or there are other problems. He will be going back to the doc soon.....so I guess we shall see. If you can donate for the care of either of these babies , please go to Husky Haven and click our PayPal. An adoption and more updates tomorrow.....tonight is the season finale of Justified.....with my luck the storm will blow in about the time I am watching that and cut my electricity....sure hope not!! !